Stuart A. Roosa orbited the moon as Apollo 14 Command Module pilot in 1971 while crewmates Alan B. Shepard and Edgar D. Mitchell explored the surface. Roosa was born August 16, 1933, in Durango, Colorado. He received a Bachelor of Science with honors in aeronautical engineering from the University of Colorado, under the U.S. Air Force Institute of Technology Program. He served on active duty in the Air Force from 1953 to 1976, retiring as a colonel. His duties included maintenance flight test pilot at Olmstead Air Force Base, Pennsylvania; chief of service engineering at Tachikawa Air Base, Japan; a fighter pilot at Langley Air Force Base, Virginia, and experimental test pilot at Edwards Air Force Base, California. Roosa was one of 19 astronauts selected by NASA in April 1966. His only space flight was Apollo 14, January 31 to February 9, 1971. His crewmates were Commander Alan Shepard and Lunar Module pilot Edgar Mitchell. Enroute to the moon, Roosa, as Command Module pilot, had difficulty docking his command ship “Kitty Hawk” with the moon ship “Antares.” Roosa’s skillful flying finally succeeded in linking the two ships. On February 5, Shepard and Mitchell landed “Antares” in the lunar Fra Mauro highlands, and for more than 35 hours Roosa orbited the moon alone while awaiting their return for the safe journey back to Earth. Roosa retired from NASA and the Air Force in 1976. He held managerial positions with several companies, including corporate vice president, International Operations, U.S. Industries, Inc., president of USI’s Middle East Development Co., Ltd., Athens, Greece, and vice president, advanced planning, Charles Kenneth Campbell Investments. In 1981, he became president and owner of Gulf Coast Coors, Inc., Gulfport, Mississippi, a position he held until his death from viral pneumonia on December 12, 1994. 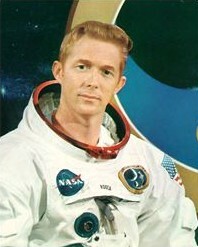 Stuart Roosa was inducted into the U.S. Astronaut Hall of Fame on October 4, 1997.